The mines of Aspiration lie far below the temple’s marble halls. Slaves toil in the blackness, striving to earn their way into the church and the light. Wynn has been sold into this fate, traded for a handful of silver. In the depths of the mines, where none dare carry a flame, he must meet his tally or die. But there are things that lurk in that darkness, and still darker things within the hearts of men. When the souls bound to the great forge are released in a failed ritual, one novice flees down into the darkness of the mines. The soul-wraiths know only hunger, the risen know only hate. In the blackest depths, Kharios must seek a light to combat the darkness which descends. There are two main characters whose stories are followed in Faithless. Wynn is full of anger, sadness, and loneliness. We meet him as a young boy of fifteen, newly sold to the Temple of the Forgefather by his own father. Expecting to go into training for the priesthood, he is instead sent to the mines of Aspiration that lie beneath the Temple. Crushed by darkness, disinterest, and danger, Wynn struggles to survive in any meaningful way. He leaves, as soon as he receives the opportunity, and enters the Church to begin his training as a priest. The second main character, is Kharios, a novice of the Temple, who is learning the art of smith-work, which is an integral part of his training to become a priest of the Forgefather. The Forgefather is the god of fire and creation. However, his voice hasn’t been heard by the priests for hundreds of years and over those years their power and their temples have fallen. There is but a single Temple left. Though the priests still go through the rituals, they have lost their belief in their god, and most are now ‘Faithless’. The story unfolds slowly but it held my attention nonetheless as Austin-King’s world building is solid. He has created a reality for his characters with both depth and breadth and a great deal of history. There are few mentions of the world beyond the mines and the Temple, but within them there is as much detail as any reader could want about mining, forging and smithing. It is obvious he has researched exhaustively into all the aspects of these industries for this book. This tale is focused on the immediate, intense, and claustrophobic mines of Aspiration and the equally claustrophobic halls of the Temple. In the former, the threat of brutality hovers over every inmate, with no redress and no protection. Friendship is rare, loyalty is rarer still. Missed mining quotas in coal and metal result in whippings, infractions against the overseer lead to hangings, the overseer’s word is law and his law is cruel. In the latter, the novices are vulnerable to the vagaries of the priests under whom they study. Kharios and Wynn fall under the tutelage of a certain Ossan, a master metalsmith, who is also a sexual abuser. Though these episodes are not graphic, enough is touched upon to make them a difficult read. As the story unfolded, the pace hastened, and moments of action and danger intensified. I began to smell the coal dust, the forge fires, the molten metals. I could see the colours of the flames, the heated iron and copper, the utter dark. I could feel the focus of the characters, their fear, and their anger. There is great twist around three quarters of the way through the book, which I loved as it surprised me. There is a certain amount of resolution at the end of this book, horrible though it turned out to be, however, there is one huge narrative thread that is left dangling, which will no doubt be picked up on in the next book of this trilogy. 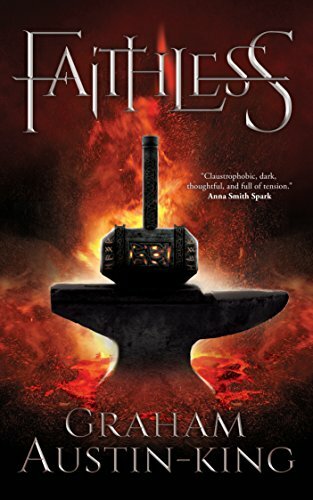 There are wonderful grim and gritty themes to this book, along with a flavouring of ancient mythology – I am reminded of Girra the Sumerian god of fire – any lover of the darker side of fantasy should enjoy reading Faithless as much as I did.